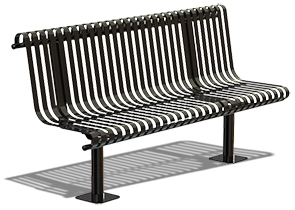 Precision crafted with contoured soft lines, the Kensington Collection park bench offers modern aesthetics—built for a lasting performance. The classic yet advanced stylings of this collection are displayed with rolled 1-1/2" steel vertical slats. These premium park benches are preferred for both individual placement and large scale multi-site applications with matching park backless benches, trash receptacles and picnic tables from the Kensington Collection.